Manchester, one of the great cities of England and home to the lovely Manchester Coffee Festival. There are only a few cities that can, after London, genuinely claim to be the UK’s second city of coffee, places such as Edinburgh and Brighton & Hove. And Manchester. Yes, Manchester. However, when I first went there, just four years ago, you could count the number of speciality coffee shops using your thumbs. A year later, and the scene had improved enough that it was featured in Issue 11 of Caffeine Magazine. By the time I returned at the end of 2014 for the inaugural Cup North, there was another handful of new places for me to visit. 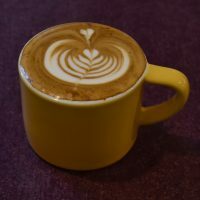 While planning my trip to Cup North (now the Manchester Coffee Festival) in 2015, I made a list of all the new speciality coffee shops I needed to visit in Manchester. I stopped when I got to 10… Add to that the handful of micro-roasters that are dotted around the city and you have a coffee scene that is really booming. As with all these guides, I need to stress that it’s not definitive, particularly given how many new places keep opening! 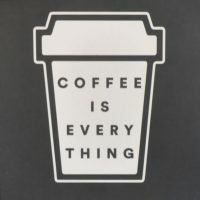 For another take on Manchester’s speciality coffee scene, take a look at local blogger Carla’s piece, while friend of the Coffee Spot, Bex of Double Skinny Macchiato, also has a mini-guide. Header image: Old Trafford cricket ground, England vs India, Day 2 of the 4th Test, 2014. Look at that sky. And the floodlights are already on (this was at 10.30 in the morning). You know what’s coming next! Once upon a time, in Ancoats, Manchester, a man called Jamie opened Ancoats Coffee Company. Roasting some fine coffee, including some of my favourite decafs, Ancoats went from strength-to-strength, until, on Monday, the Ancoats Coffee Co Coffee Roastery and Café Space (which is a bit of a mouthful, so we’ll stick with Ancoats for short) opened its doors in a magnificent new space in the Royal Mills. We’ll look at the roastery in a future Meet the Roaster; today we’re concentrating on the new café. Superficially reminiscent of Sheffield’s Tamper Coffee at Sellers Wheel, Ancoats is housed in an old mill building, with a low, brick-arched ceiling and bare brick walls. Potentially a rather dark, unwelcoming space, with only borrowed light from windows at either end, Ancoats is made warm and welcoming by the clever use of lighting. You can also sit outside in the amazing, glass-ceilinged courtyard. Ancoats, naturally, showcases its own considerable output, with the Warehouse blend, plus a decaf and a different single-origin every week on espresso. There are also three single-origins on filter, which change on a daily basis. If you ask nicely, chances are that you can have any of Ancoats considerable output of single-origins. I first visited Ancoats in August 2014, when it occupied the corner of a small unit in the corner of an industrial estate in Manchester’s Ancoats district. Fast forward 18 months, and Ancoats, after only two years, was doing so well that it could move not only into bigger premises, but into an amazing café/roastery in Manchester’s Royal Mills development. The Coffee Spot covered the café-side of things back in November last year, so today I’m focusing on the roastery. Ancoats has long been a favourite of mine, roasting some fine coffee, including some of my favourite decafs. This is joined by its ubiquitous Warehouse espresso blend and anything up to nine single-origins. You can get the Warehouse blend, decaf and a different single-origin every week on espresso at the café, while three single-origins are on filter at any one time. 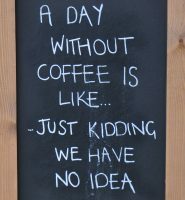 These change on a daily basis and, if you ask nicely, chances are that you can have any single-origin that’s in stock. I rarely venture north of the River Irwell in Manchester. In fact, other than my occasional pilgrimages to the Grindsmith Pod, I think the last time was when I attended the original Cup North in 2014. So I am indebted to the Best Coffee App for drawing me to Chapel Street and the gem that is Another Heart To Feed, a Melbourne-inspired coffee shop and kitchen which opened in March this year, serving food from an all-day brunch menu and some excellent coffee from London’s Union. There’s the usual espresso-based menu, with Union’s Bright Note as the house-blend, plus a single-origin on pour-over through the V60 and another available as bulk-brew filter. The options change every week or two for the bulk-brew and every two/three weeks for the V60. There’s also loose-leaf Bohea Teas, Kokoa Collection hot chocolate and cakes from local bakers, The Brownie Owl. Drawing on its Melbourne heritage (the owners spent four years there), Another Heart To Feed offers full table service, a carafe of water and menu magically appearing on your table as you are invited to take a seat. Unusually, Another Heart To Feed closes at three during the week and at four at weekends. January 2018: Another Heart to Feed has moved south of the river, all the way to West Didsbury. 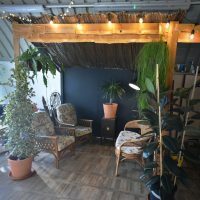 I've not had a chance to visit the new location, but local food blogger, The Manchester Tart, can give you the lowdown. Ezra & Gil’s one of the many Manchester Coffee Spots that popped up in 2015. In Ezra & Gil’s case, it’s in good company, sitting on the corner of Hilton and Newton Streets, almost equidistant between TAKK and Foundation Coffee House (which I finally visited a mere 18 months later). The likes of Fig + Sparrow and North Tea Power are also nearby. You could do a coffee-crawl taking in all five, while walking less than ½ km! I discovered Ezra & Gil, which opened in late July, primarily through social media, where I was tempted by picture after picture of some lovely-looking food. 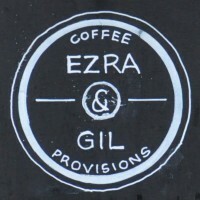 Unsurprisingly, Ezra & Gil is as much about the food as it is about the coffee, as well as selling a range of groceries on the side. In this respect, it reminded me of Bridport’s Soulshine Café. Ezra, by the way, is Hebrew for “helper”, while Gil means “happiness”. The food, with an impressive all-day breakfast range and lots of other goodies, is cooked on-site in a large kitchen behind the counter, while the coffee is from local roasters Heart & Graft. The famous Barnraiser blend’s on espresso, with a single-origin on V60 for filter fans. November 2017: Ezra & Gil now uses another Manchester roaster, ManCoCo, with its standard espresso blend, plus a single-origin on V60. 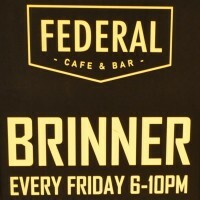 I swear that the good people of Manchester were waiting for me to leave… I’d been visiting for the inaugural Cup North back in 2014 and no sooner had I left, than it seemed a slew of new coffee shops opened, led by Federal Café & Bar, which, by the way, does what it says on the tin. By day, it’s a café, while by night, it morphs into a bar, although, as I discovered, the staff will happily serve you coffee long into the night (and, I suspect, alcohol during the day). The coffee side of the equation is handled by Kiwi transplants, Ozone, supplying the Hodson blend and decaf on espresso, with a couple of single-origins on pour-over, impressive when you consider the (lack of) available space. There’s a small selection of wine (five) and beer (four), plus loose-leaf tea, hot chocolate and soft drinks. Federal’s other main strength is food. This is prepared on-site in an impressively compact kitchen which takes up half of the (not very much) space behind the counter. There are decent breakfast (until noon), lunch (from noon) and brunch (all day) menus, plus, on Friday/Saturday nights, one of the greatest inventions ever, Brinner! 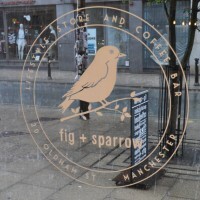 Just a block down the street from the mighty North Tea Power, and a few steps along Oldham Street from its junction with Church Street, is relative newcomer to Manchester’s coffee scene, Fig + Sparrow. Established in 2013, it’s half life-style shop, half café, but 100% excellent. Serving an espresso-based menu using beans from London’s Climpson and Sons, with guest filters on Aeropress and Chemex, plus loose-leaf tea from Newcastle’s Ringtons, Fig + Sparrow also does food. There’s a small but excellent range of cakes, an all-day breakfast menu, lunch, with various specials, sandwiches and a separate toast menu. You have to admire a place that has a separate toast menu. The front half of the store is given over to the retail arm, selling gifts and various items for the home. The back half houses the coffee shop, with two rows of seating and the counter right at the back. It’s beautifully laid-out, uncluttered and spacious, with wooden floorboards and whitewashed walls and ceilings. Although not much natural light reaches the back, the high ceiling and multiple light bulbs make it surprisingly bright. The result is a very relaxed atmosphere, with quiet, easy-listening music in the background. The Foundation Coffee House joins a growing band of speciality coffee shops in Manchester’s Northern Quarter, following in the footsteps of the pioneering North Tea Power and joining the likes of Fig + Sparrow and TAKK. Located on the ground floor of the magnificent Sevendale House, a brick-built edifice taking up the entire block, Foundation consists of multiple, connected spaces and is easily the biggest of the bunch, surpassing even the nearby Ezra & Gil in size. 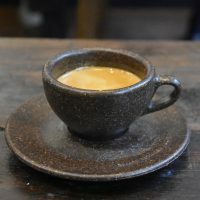 Foundation uses Cornwall’s Origin, with its Los Altos Nicaraguan single-origin on espresso, where it’s joined by a guest, plus four single-origins on pour-over, prepared using either V60 or Aeropress, the method being matched to the particular coffee. There’s also bulk-brew for those in a hurry, Foundation starting the day with the San Fermin Colombian single-origin, then mixing things up as the day goes on. Other than the Los Altos espresso and San Fermin bulk-brew, which are always on, the options change regularly, Foundation getting a few bags in from Origin, then moving on once they’ve gone. There’s also tea and hot chocolate, plus beer, cider and wine. If you’re hungry, Foundation has decent breakfast and lunch menus and a wide range of cake. A relatively recent addition to Manchester’s coffee scene, Grindsmith opened in February 2014. Just across the river in (say it quietly) Salford, it’s a pioneer, funding itself via Kickstarter. I should confess that I have a vested interest, having funded Grindsmith sufficiently to get the Coffee Spot a prime spot on the counter-front, just below the espresso machine. My initial reaction to the Deansgate Grindsmith is its size. A more traditional coffee shop setting than the pod, what it loses in intimacy, it more than makes up for in space, seating, an expanded food offering and gorgeous, brick arches. I know that might not appeal to everyone, but really, brick arches! How cool is that? 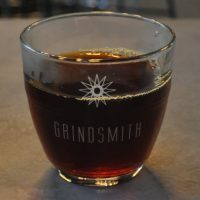 The same Grindsmith dedication to quality coffee is still there, though, with a single-origin from Heart & Graft as the house-espresso, plus decaf and a regularly-rotating guest espresso. There’s also a dedicated brew-bar, with Kalita Wave and Syphons on offer, plus bulk-brew filter for those in a hurry, and, of course, loose-leaf tea. Grindsmith has expanded rapidly since its successful Kickstarter launched the pod just three short years ago. The third of its (for now) four branches is in Media City, which opened six months ago, following on from the original Pod and Deansgate. Media City is the probably the most traditional coffee shop setting of all four (the Pod is, well, a Pod, while the other two, Deansgate and Cross Street share space with other organisations. Meanwhile, this one stands alone on a corner to the west of the new Media City development in Salford. 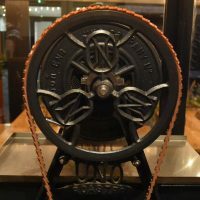 Grindsmith has always built its reputation on coffee excellence, but in Media City, it has added a large kitchen, enabling it to expand its food offering. There’s a full and impressive brunch menu, served until four o’clock, plus something entitled “food on the go”, including breakfast, lunch and sandwich options. Finally, there’s plenty of cake. The coffee offering is centred around the (white) Black Eagle espresso machine, with a single-origin from local roasters, Heart & Graft, on the main grinder and decaf on the second grinder. This is backed up with a single-origin on bulk-brew and another available through the Kalita Wave, both from guest roasters. Regular readers know that I have a soft spot for Manchester’s Idle Hands, and its owners, Dave and Lucy. Having started as a pop-up near Piccadilly Station, Idle Hands is now into its fourth incarnation, although this location, in the heart of Manchester’s Northern Quarter, is its first permanent home. In comparison to previous incarnations, the new location is huge, with plenty of seating and, for the first time, a large kitchen at the back. Idle Hands has always been known both for its coffee and its (sweet) pies, both of which are on display here. 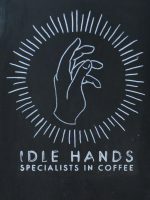 A true multi-roaster, Idle Hands usually has two single-origins on espresso, another on batch-brew and five or so on pour-over through either the Aeropress or V60, depending on the chosen bean. The options change regularly: whenever a particular bean runs out, it’s replaced. When it comes to pie, there are usually five or six choices, all made fresh that day by Lucy. When a pie is gone, that’s it for the day, although don’t expect to see it the following day, since Lucy frequently rings the changes. In addition, there are now full breakfast and lunch menus, along with beer, wine, spirits and cocktails. I’m in Manchester for my annual Manchester Coffee Festival visit, having arrived a couple of days early to check yet more of the city’s excellent coffee scene, including a whole slew of places which have opened since my previous visit (for last year’s Manchester Coffee Festival). I also met up with fellow coffee blogger, Charlotte Scotland (whose blog, Coffee All Way, has just launched), so it was appropriate that we ended up at Just Between Friends Coffee. Just Between Friends occupies a small spot on the south side of Tib Street, halfway between the venerable North Tea Power and another newcomer, Siop Shop. There are a couple of two-person tables outside on the busy street, while a large sign proclaiming “Coffee” in big letters catches the eye. Inside, Just Between Friends is a small, cosy space with limited seating and a warm welcome. 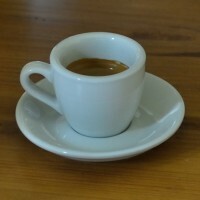 The coffee, from London’s Assembly, is available on espresso, with a daily batch-brew option. There’s also a limited food menu, including toast, muesli, a couple of toasties and a selection of cakes. The concept of the railway arch as home to a coffee shop (The Fields Beneath or Doctor Espresso – Mama V's spring to mind), roastery (Neighbourhood Coffee), or, indeed, bakery (Hart’s Bakery), is well-established. For the last couple of years, their ranks have been swelled by Manchester’s ManCoCo, which is, as far as I know, the only combined coffee bar/roastery in a railway arch. Tucked away on Hewitt Street behind Manchester’s Deansgate, ManCoCo takes a little bit of finding, but once you find Hewitt Street itself, ManCoCo is pretty obvious, on the north side of the street. 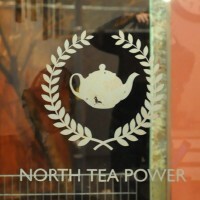 North Tea Power, in the centre of Manchester, is dead easy to find. Start at the Market Street tram stop. Turn your back on the Costa and Nero that face you as you step off the tram and gird your loins when you see the Starbucks on the other side of the road. Head down Tib Street, past the Starbucks, and, after a short walk, you’ll reach the crossroads with Church and Dale Streets. On the other side, on an elevated colonnade running along the right hand side of the street, you’ll find North Tea Power. Since the summer of 2010, when it opened, many people have considered North Tea Power to be the place to have fine tea and coffee in Manchester and I can see why. It’s lovely and the owners, Wayne and Jane, have poured their passion and attention to detail into every aspect of the place. Come on, you have to admire that level of dedication: they even have rhyming names! This infectious love has rubbed off on everything, including the rest of the staff, making North Tea Power one of the nicest spots I’ve been to for a long while. Continuing a theme of Coffee Spots in glorious Victorian shopping arcades, I present Pot Kettle Black (PKB), which has been gracing Manchester’s coffee scene since the start of October 2014. The Barton Arcade, home of PKB, is one of the most beautiful I’ve seen and PKB takes its lead from there, with gorgeous external features and some of the most ornate and sumptuous window art there is. Stepping inside, PKB is one of the most beautifully-appointed coffee shops I’ve ever visited. It’s a spacious delight of glass, wood and ornate ironwork, with some great tiling thrown in for good measure. There’s a wide range of seating options and, with the laptop/smart phone generation in mind, power outlets have provided at every possible opportunity. 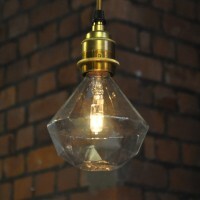 While this might be at odds with its Victorian heritage, it’s a welcome addition. However, a beautiful environment is not much use without some decent coffee to serve in it. Fortunately, PKB scores highly here too, with Workshop’s Cult of Done and decaf on espresso, plus guest filters through Aeropress and V60. There’s loose-leaf tea as well, with a tempting selection of cakes, sandwiches and a small breakfast menu, including porridge and toast. Tib Street, in Manchester’s Northern Quarter (itself replete with multiple speciality coffee shops) is a busy place. At one end, there’s the venerable North Tea Power, while if you progress northeast, you’ll soon reach newcomers, Just Between Friends Coffee, closely followed by the subject of today’s Coffee Spot, Siop Shop, across the road from the recently-closed Ezra To Go. Siop Shop is a relative newcomer itself, having been open for precisely one week when I was last in Manchester (for the 2017 Manchester Coffee Festival). As a result, it didn’t quite make my radar, but on my return this year, it was high on my list. For those that don’t know, Siop (pronounced “shop”) is Welsh for shop. Iwan, who owns Siop Shop along with his partner, Lucy, is Welsh, Siop Shop providing a small slice of Wales in Manchester, complete with bilingual signs. You can even say hello and order in Welsh if you like! Siop Shop made its name through its awesome doughnuts, but there’s also full breakfast and lunch menus, plus cake and sandwiches. Local roaster, Dark Woods, provides a bespoke house-blend (Coffi Coffee) on espresso, while there’s a daily guest on espresso and another on V60. In Manchester’s Northern Quarter, five minutes’ walk from Piccadilly Station, there is an unprepossessing street on which, about half way down, is an unprepossessing store front, part of a tall (four storey) terrace of solid, brick-built buildings. This in turn proclaims itself to be the home of TAKK, a relative newcomer to the Manchester coffee scene. Perhaps this is down to innate modesty (although given the A-boards, I doubt that) or maybe it’s a cunning ploy to lull you into a false sense of security, but the exterior really gives no clues as to the delights that await you when you step inside. TAKK, which is “Thanks” or “Cheers” in Icelandic, is a friendly, welcoming place, its size concealed by what appears to be a relatively small store front (it’s got roughly the same floor area as Manchester’s North Tea Power). The coffee is excellent, with a bespoke house-blend from Bristol’s Clifton Coffee Roasters (NorthernProjekt) and regularly-rotating single-origins from various guests on filter, with Berlin legends The Barn as a mainstay. Add to that an increasing focus on food, with locally-sourced ingredients, regular specials and simple menus, part of TAKK’s push to be the place for breakfast, lunch and coffee.